The Indian Coast Guard has apprehended a Pakistani boat with nine crew members from the Arabian sea off Gujarat. The coast guard ship Samudra Pavak caught hold off the boat at around 10:15 in the morning, reports The Hindu. Preliminary inquiry revealed that the crew members are reportedly fishermen, but the Coast Guard has still taken the boat with its crew to Porbandar for further investigation. 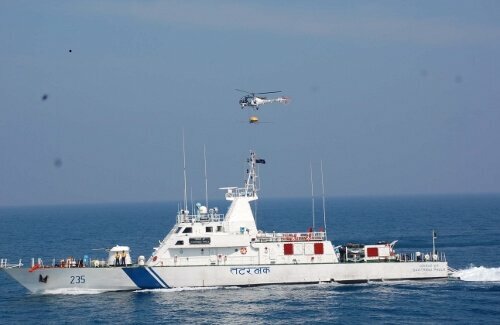 A release issued by the Defence PRO Wing Commander Abhishek Matiman stated that “in the prevailing security scenario, enhanced vigil with deployment of ships and aircraft by the Indian Coast Guard is being exercised off the Gujarat coast”, reports The Indian Express. The Coast Guard has intensified surveillance along the 1,600-km long coastline in Gujarat after the Indian Army’s surgical strikes against terrorists in Pakistan-Occupied Kashmir.